Brusasorci, known also as Domenico Ricci of Riccio, was from the Brusasorci family of painters from Verona. Domenico’s father Agostino Riccio was a painter, as were his sons Felice (1542 – 1605) and Giovanni (1544 - ? ), and daughter, Cecilia (1549 – 1593). Training first with his father, Brusasorci then apprenticed with another Veronese painter, Giovanni Francesco Caroto (1480 – 1555). Brusasorci developed a mannerist style of painting, said to be of the avant-garde of Verona’s painting, before masters of the Venetian School such as Paolo Veronese (1528 – 1588). His known works include the frescos in the Municipio in the city of Trento, in the Palazzo Vescovile of Verona, the Palazzo Ridofi-Lisca and the San Pietro Martire. His piece in the Palazzo Ridofi-Lisca is a ceremonial work depicting The Holy Roman Emperor Charles V (1500 – 1558) and Pope Clement VII (1478 – 1534). In the San Pietro Martire he painted his piece, Madonna in glory and two saints. 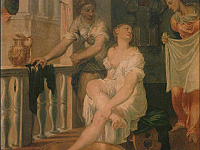 Of his works found in the Uffizi Gallery are Bathsheba Bathing, from Cardinal Leopoldo de’ Medici’s estate. Another piece of Brusasorci’s is found at the National Gallery of Scotland, The Coronation of the Virgin with Apostles at her tomb below. These works are dated from around 1551 through 1569. Brusasorci had a number of pupils, including his children, a Venetian painter, Giovanni Battista Zelotti (1528 – 1578), and Veronese painters, Bernardino India (1528 – 1590) and Paolo Farinati (1524 – 1606).